I'm heading off to Cleveland this week to join a cool bunch of artists on the set of Quilting Arts TV...and of course the ever fabulous host Pokey Bolton. 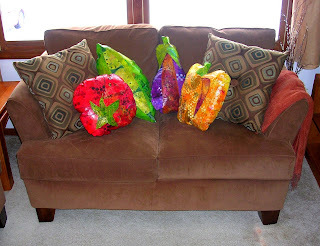 I'll be showing some veggie pillows made out of cloth/paper, which is the subject of my fall book release. That should be fun! Here's a preview of some of the pillows.